Remember this session I did with Hadley? 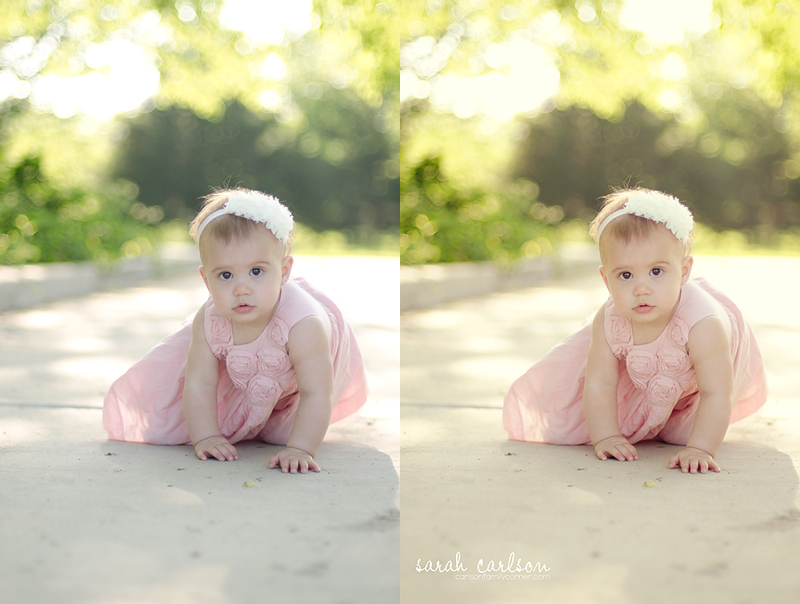 I used Totally Rad's RadLab to process the images from her session (with the exception of the black and whites). While I don't use RadLab very often (I usually just stay in Lightroom), it's a fun editing tool to use from time to time. I started with a slight white balance tweak in Lightroom to warm up the images a bit and remove some of the green tint and then cropped/straightened in Lightroom, too (left image). I did this for all the images before pulling them into Photoshop. While RadLab works well with Photoshop Elements, one nice thing about using RadLab in full Photoshop is that you can create an action with your recipe so that you can batch edit. My action recording was just two simple steps - 1. go to filters > convert for smart filters (so that I'd be able to go back and tweak each image if necessary) and 2. in the RadLab panel, run my "hadley" recipe I created for Hadley's photos. Recording and running the action helped me get through a large number of images more quickly. Info on how to create an action using RadLab can be found here. I opened my images in groups of 5-10 to keep my system from running too slowly and ran my action on them. I then looked at each image, and for the ones that needed tweaking, I could open up the RadLab layer (which opens the RadLab panel), tweak my sliders to taste, close the panel, and save the image. Use coupon code 1338SARAH for 15% off your purchase at the Totally Rad store!